Have you got what it takes to survive five fright-filled trails of haunted souls? 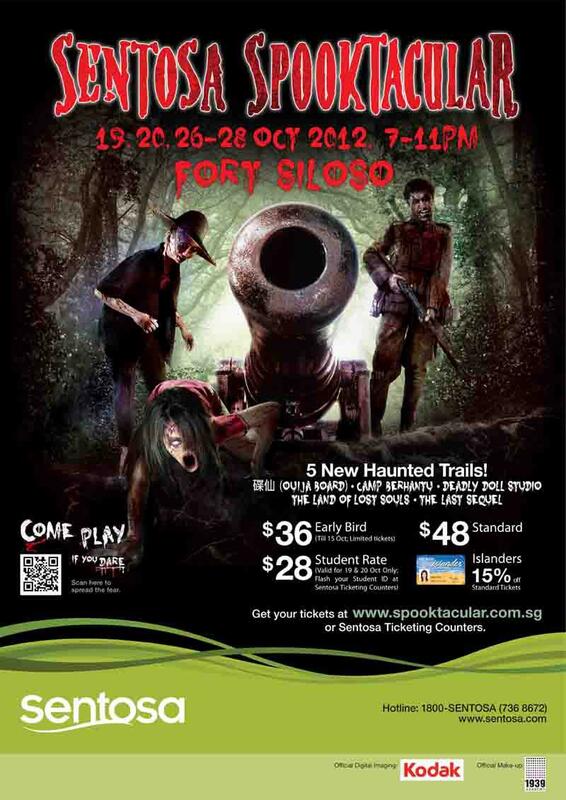 This Halloween, as the moon rises and light fades, Fort Siloso will be teeming with ghoulish goings-on as the most desperate, tortured and vengeful spirits rise to feed off the frenzied terror of anyone crazy enough to enter. So come play this October … WE DARE YOU ! Early Bird Pass will be $36 from now till 15 Oct 2012 (Limited tickets available). Islanders 15% off Standard Pass rate. Safra, ISIC, American Association and AREU Union members 10% off Standard Pass rate. Only on 19 and 20 Oct 2012. Includes $10 worth of snacks. Available for purchase on event day only.